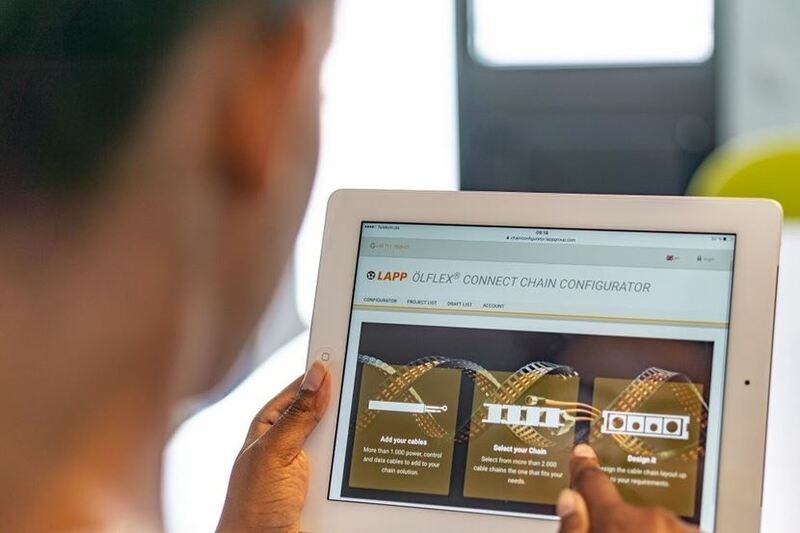 The new ÖLFLEX® CONNECT CHAIN configurator: You can use it to digitally engineer a power chain online with just a few clicks of the mouse. Configuring power chains is no longer a complicated task as this tool makes it easy, even for less experienced users. The ÖLFLEX® CONNECT CHAIN configurator automatically switches off all error sources and always finds the best solution. The online configurator acts as a step-by-step guide through the choice of cable chain, cables and relevant accessories. It makes sure that components are compatible every step of the way, especially when it comes to the cables’ minimum bend radius. The cable chain must not have a smaller bend radius than the cable. If this is the case, the configurator will display a warning message and suggest other types of cable chain. Other criteria include the travel length, acceleration, temperature behaviour and shielding. The configurator automatically excludes cables that are not suitable for the application. When the configuration is complete, you will recieve a personalised quotation and are then able to choose whether you want to purchase the power chain fully assembled by LAPP or as individual components, with the option of having the cables pre-cut to the appropriate lengths.